The Pre-K For All program at St. Michael’s Catholic Academy has a mission to offer opportunities for your children to develop intellectually, physically, and socially; to develop respect for the environment; to grow in the ability to relate to others peacefully; and to enjoy the appreciation of the rich diversity of people they encounter. These are accomplished in a comfortable yet challenging environment. Additionally, our Pre-K Program is an Enhanced Language Support program, with a target language of Mandarin. 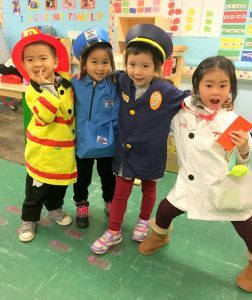 Our teachers are New York State licensed and certified early childhood educators, experienced and trained professionals, chosen for their warmth, creativity, experience with children, and commitment to excellence. Our staff includes certified, educated, loving, experienced and nurturing teacher assistants. Our staff speaks English, Chinese, and Spanish. Free full day Pre-K program from 8:30am to 2:45pm.